"Making the World Clean and Safe"
Hydrojetting uses high-pressure, high-velocity water jetting equipment to remove clogs from accumulated grease, scale and silt in drain lines. Pumping 20 gallons per minute with pressure up to 4,000 PSI, our hydrojets can effectively clear away blockages, cutting roots and scouring away debris, while cleaning the inside of the pipes at the same time. Hydrojetting can also be used to clear debris in drains around your house, downspouts, culvert pipes, etc. Hydrojetting, in conjunction with regular grease trap pumping for commercial kitchens, provides for the most comprehensive maintenance program so you can avoid costly repairs and inconvienent back ups. Our knowledgeable staff can address any questions you may have. Call us today at: 573-474-5489. Our regular operation hours are Monday through Friday 8:00 am – 4:30 pm. 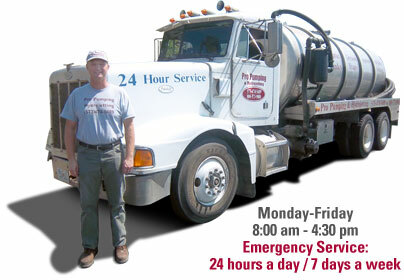 We also offer emergency service and are available 24 hours a day, 7 days a week.